Tis the season… the season of cookies, Christmas music, New Years celebrations, family, friends and “Giving Back” I am so so excited to share this post with all of you! Not only do I have a GREAT new recipe, my Peppermint Sugar Cookies, but also some tips and tricks to throwing a perfect cookie swap party! These cookies are so easy to make and the flavor is perfection. A little sweet, a little minty, a lot delicious! The peppermint crunch baking chips I used are awesome, they aren’t hard like a candy cane but more on the chewy side, so good in these cookies! With a great cookie recipe, some festive ribbon, bows, labels and Rubbermaid TakeAlongs you can throw a simple but perfect cookie swap! In my opinion the best gift you can give is a gift that is from the heart and one you can eat! The holidays should be all about getting together with friends and family, laughing, enjoying good food and creating wonderful memories. I thought it would be really fun to throw together a little cookie swap party for the moms and grandmas so I headed out to Walmart to pick up all my supplies. Cookie swaps are a fun way to give thanks to those you care about too! Take some back home for yourself and take another package to a friend, a firehouse, police station or even someone you don’t know well all in the spirit of Giving Back. I grabbed some adorable holiday cards thats just happened to be covered in cookies and used them as my invites. A little snowman notebook to write out the names of the cookies on the table. I found some cute, inexpensive holiday ribbon, chalkboard labels and bows to wrap and decorate our cookie filled Rubbermaid TakeAlongs. The red cups, plates and peppermint sticks are all from Walmart as well. I did grab two sizes, the deep square and the rectangle Rubbermaid TakeAlongs, though there are many different sizes to choose from, these worked out great for our cookie swap. These containers are absolutely perfect for gift giving of any kind… whether some chicken soup, cookies or leftovers to share with others. The Quik Clik Seal™ technology lids keep food secure and helps prevent spills in transport, because no one wants cookies on the floor of their car. OH and something fabulous for you… There is a $1 Off Of Any 2 Rubbermaid TakeAlongs Products rebate offer, exclusive to Walmart shoppers!! Lucky me, my family bakes great cookies!! On the table are my Peppermint Sugar Cookies, my moms White Chocolate Cranberry Cookies, Grandma Lou’s Chocolate Fudge Cookies and my mother in laws Coconut Macaroons!! Mouth watering, I know!! The tablescape is really simple but so festive right?!?! We had a blast laughing, sampling cookies and packing them up to take home. The Rubbermaid TakeAlongs are functional and inexpensive, just perfect for sharing goodies. To dress them up we wrapped our cookie filled containers with really chalkboard labels, cute ribbon and bows. How cute are our delicious packages of cookie! Can’t forget party snacks too… so here are some great recipes that would be a wonderful addition to your cookie swap: Fried Prosciutto Tortellini, Spinach Artichoke Puff Pastry Cups, Sun Dried Tomato Pesto Crostini, or Roasted Eggplant Dip. Using a small scoop, plop the cookie dough out onto a parchment lined cookie sheet about an inch apart from each other. Bake for for 10-12 minutes or until the very outer edge is lightly golden. Don’t forget the $1 Off Of Any 2 Rubbermaid TakeAlongs Products rebate offer, exclusive to Walmart shoppers!! Looks like fun! I really want to do a cookie swap one of these years! 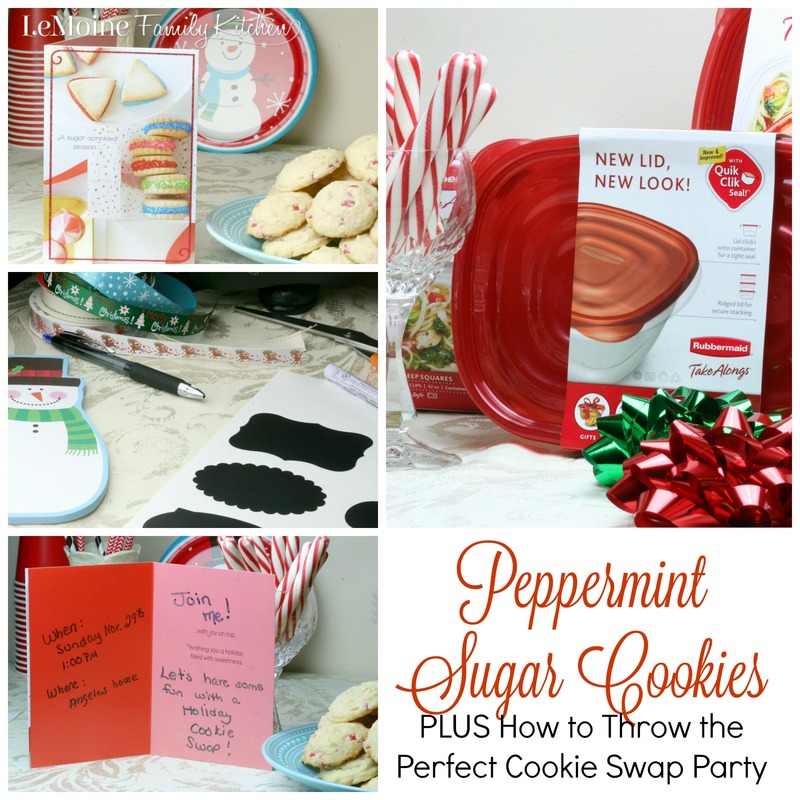 Cookie swaps are so fun and totally easy to throw together!! Enjoy! It was a blast!! Lots of tasty cookies, laughs and an easy party to throw with some fun decorations and these TakeAlong containers! These peppermint sugar cookies look so tasty! What a great holiday recipe. But oh my goodness that whole table of cookies!! Can I come to your place? They are DELICIOUS!!! All the cookies were great! We had a blast! They were the perfect take home container for the party! I even sent home some turkey soup with my husbands grandmother. I just love cookies! this is one of my favorite activities of the season. 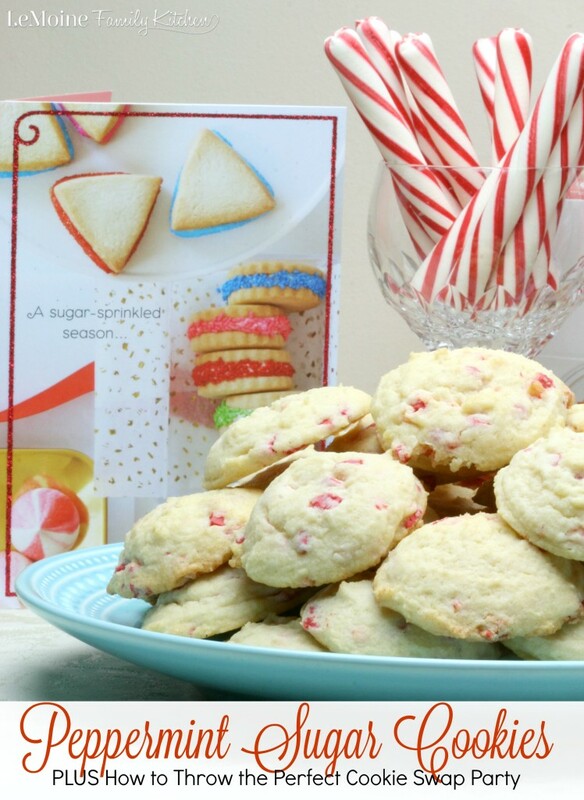 I had never tried peppermint sugar cookies before, so this recipe will be fun to make. They are perfect!! 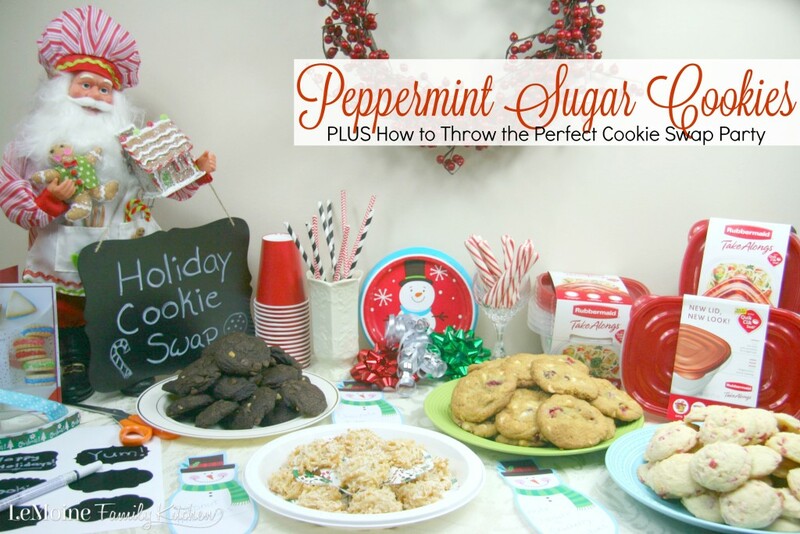 A simple sugar cookie with that minty finish…. almost refreshing actually! They were a huge hit! These look delicious! 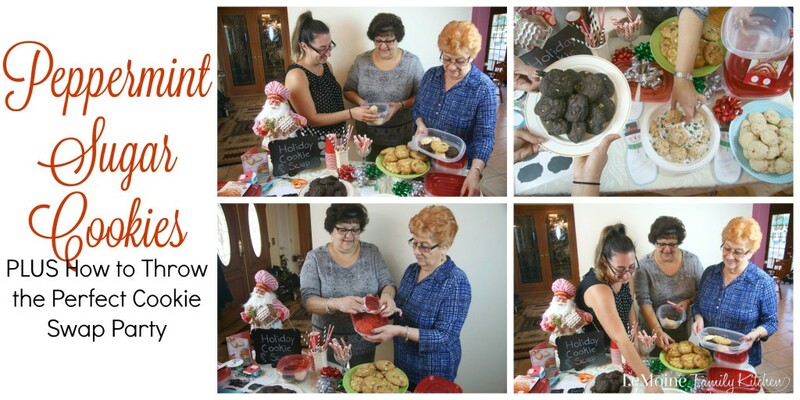 And great tips on the cookie swap! Thanks so much! A few cute decorations, great cookies and a sturdy take home container is all you need! So fun! I bet you had a blast doing this post Angela…so much yumminess! I love the new TakeAlongs. The fact that they are red makes them work for any season, to me. And those cookies! I adore pretty much anything peppermint. I grew up making pfefferneuse (a German spice cookie) and traditional sugar cookies. They are fantastic! I even sent my husbands grandmother home with soup in them! Glad you like the cookie recipe! It’s such an easy one to throw together. I’m going to have to look up those German spice cookies! Cookie swaps are so much fun! Thanks for stopping by! Exactly! Party based around cookies- can’t go wrong! It’s definitely a great way to get together with friends! Cookie swaps are so much fun! These cookies sound delicious. It really was delicious & so fun! So many great tips and I love your recipe! And those Rubbermaid containers too! Thanks Michelle! The containers are great! I’ve used them for the cookies, soups & salads already! A few girls and I have a cookie exchange every year. I love your tips. It’s such a fun relaxed get together! Love cookie swaps! Glad you found these tips helpful!